Hey, I'm Robert. Web Developer and Blogger behind WebsiteSetup.org. If you’re looking to set up your own website quickly and easily, look no further. Below you will find a step-by-step guide, with screenshots, explaining in detail how to do it. The best part? You can have it up and running in a matter of minutes. The very first step you need to do is sign up using a web host and register the domain name of your choice (if you don’t have one yet). 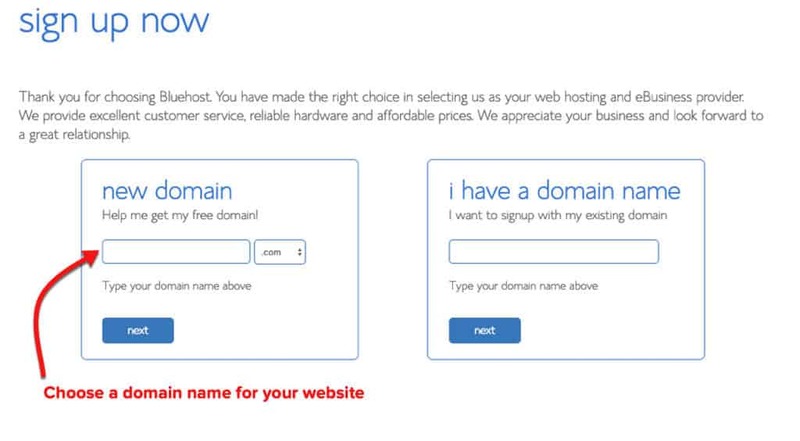 I’m currently using Bluehost as a domain provider and web hosting service, which I’ve laid out in the example below. Feel free to use any hosting provider of your choice, but I prefer Bluehost for its simple usability, reliability and 1-click-installation with WordPress. It makes integrating WordPress easier than I have ever seen with any other web host. If you’ve already have a domain name, it’s just as simple. You can still use Bluehost as your hosting provider, even if you purchased your domain name from another provider e.g GoDaddy. The registration process takes no longer than 5 minutes from start to finish. Once you’ve created an account with Bluehost, I’ll explain how you can install WordPress using the Bluehost control panel. I’ve also included guides for Joomla & Drupal if anyone is looking to use them. Quick tip: When creating any website, you must have a domain name and a host. Without these, you won’t be able to create a website for users to view, browse, or shop on. Full disclosure: I earn a commission if you end up purchasing Bluehost through my referral links in this guide. What’s important, the price for you is not just the same – it’s lower than when you do it directly. This helps me to keep WebsiteSetup up and running and up-to-date. Thanks for your support. To get started, head to www.Bluehost.com and click on the “get started now” button. · If you use this link, you’ll be able to get a FREE domain for a year, too. This discount applies to all WebsiteSetup.org visitors (Yay!). Free Domain and Site Builder. 1-Click WordPress Install. 24/7 Support. 30-Day Money-Back Guarantee. 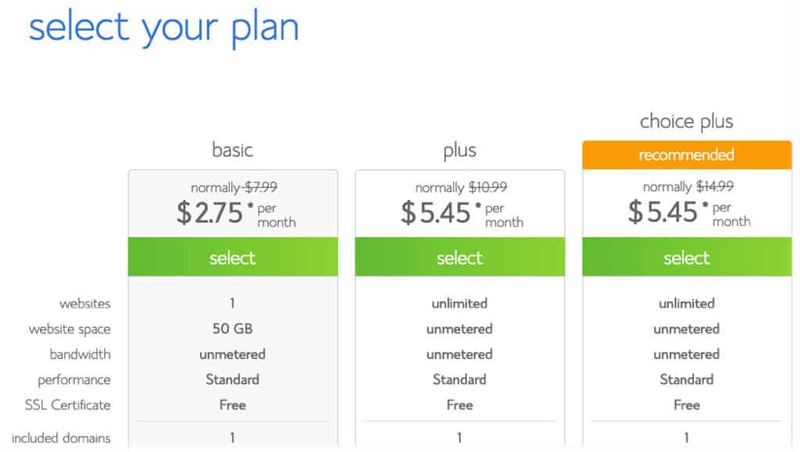 Once you click “get started now,” you’ll be taken to a page where you can select the hosting plan of your choice. Save your hard earned cash and opt for the cheapest package to start with. Start with “basic” plan. You can always upgrade later, if you need to. Your domain doesn’t have to end in .com. You can choose a different site ending if you wish, e.g .net, .org, .us, .biz, and .info if the first choice for your domain isn’t available. If you’ve already got a domain name, just enter it in and click “Next” in the “I have a domain name” form. If you aren’t ready to choose a domain right this moment, you can do it at a later point in your website setup. If you’re not sure about the domain name yet, there’s an option to skip this step for now. 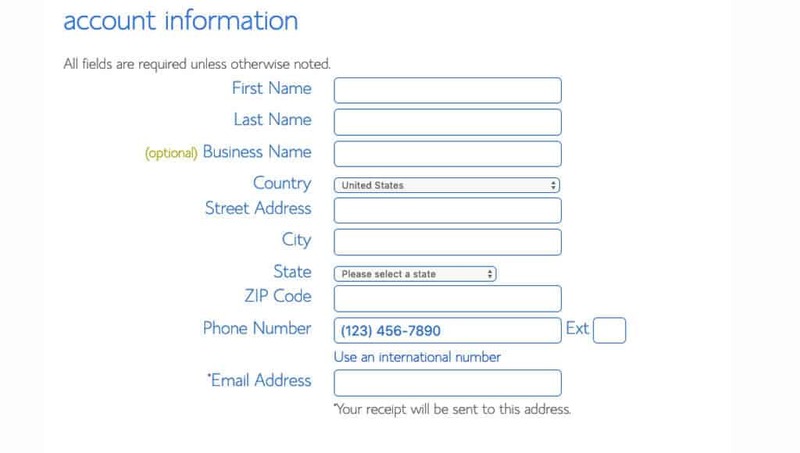 To create your account, just enter your personal information on the “create your account” page. You’ll need to add your first name, last name, country, street address, city, zip code, phone number, and email address. Your receipt will be sent to the email address you enter. It’s optional to also add your business name in this form. Finally, enter your payment information to continue. If you want to use PayPal, click “More payment options” link and you’ll see a PayPal option. These are the last steps you’ll go through before your account creation is complete. Pay close attention to the extra options available, like Domain Privacy Protection. Choose a plan and decide which of the optional add-ons you’ll need (all the options described below). Bluehost offers tons of great add-ons. Most of them aren’t necessary, but here are some add-ons to consider. Domain Privacy Protection: It is only $0.99 cents more per month. It will keep your personal information, e.g. your name and address, private. If you want to keep your website and domain information anonymous, spend the extra $0.99 per month. If you don’t, be sure to uncheck this box. SiteLock Security: This add-on verifies your email address, physical address, and phone number. If you plan to sell a product or service on your site, this feature might be helpful for proving your credibility to customers. This service is an extra $1.99 per month, or $23.88 per year. Codeguard Basic: This provides extra security to your website. WordPress is very secure, but this extra feature allows you to backup your site regularly. If anything happens, or if you make a mistake, it will be easy to turn back the time and revert to one of the previous backups of the site. If you think you’ll use this feature, it’s definitely worth the extra $2.99 per month. Bluehost SEO Tools Start: Bluehost claims that this tool can help you get search engine rankings. This feature is $1.99 per month or $23.88 per year. Office 365 Email Essentials: A safe and reliable email platform powered by Microsoft, with online access to email and calendars from any device or web browsers. $2.99 per month. Once you’ve selected your add-ons and signed up for a Bluehost account, you’ll be all set to build websites using your chosen or existing domain name. Log in to Bluehost and pick the website builder of your choice: WordPress, Joomla, or Drupal. Bluehost offers “one-click installation” for WordPress, Joomla, and Drupal for beginner users so that you can have your site ready to go in seconds. Just click on your preferred website software below and the guide will expand (with images). Once you’ve chosen a domain name and you’ve registered for an account with Bluehost, you’re ready to build with WordPress. 1) You’ll begin by selecting a WordPress theme for your website. Don’t worry too much about your selection – you can change the theme later if you change your mind. Once you’ve chosen a theme, log in to WordPress with the button on the left-hand side of the screen and start putting your site together piece by piece. 2) Next, you’ll be prompted to select which kind of website you’d like to set up. Select whether you’re looking to create a “Business” website or a website for personal use. 3) Once you’ve made a selection, fill out the Site Title and Site Description of your choice. 4) Moving on to the next step, you’ll be prompted to select whether you plan to update your site with news and blog posts. If you don’t, you can move on to the next step. If your site will be updated regularly with news and blog posts, select what visitors will see on your homepage. 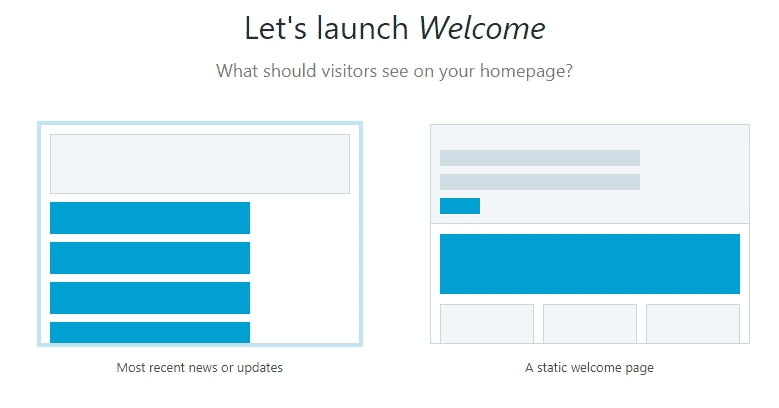 You’ve got two options here: your most recent news and updates, or a static welcome page. If you plan to use your website as a blog or news source, I recommend choosing the first option so that users will see your new posts as soon as they visit your page. 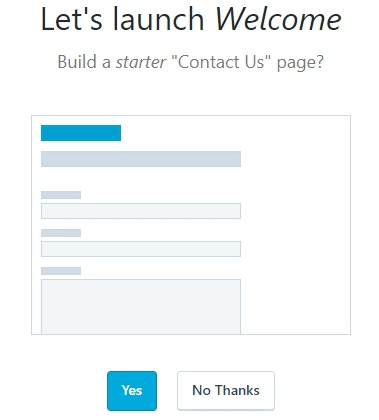 5) Build a basic “Contact Us” page if you want to provide users with a form to contact you or your company. 6) Finally, you’ll need to connect your Jetpack profile to WordPress to improve security, grow traffic, and track statistics. 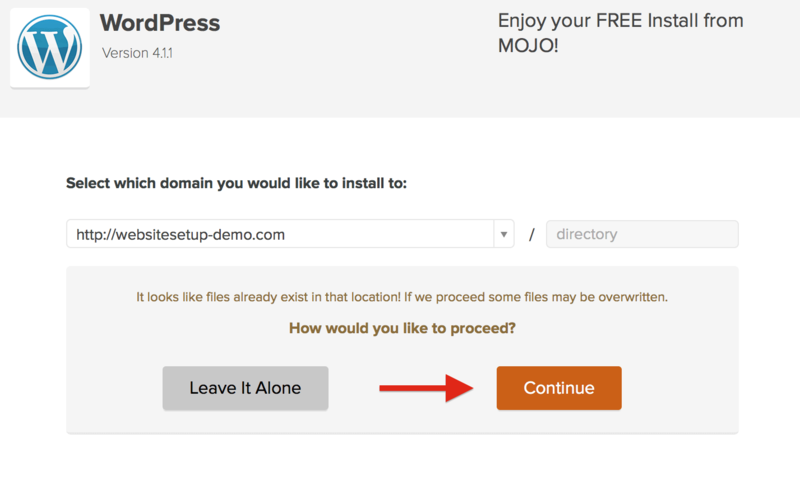 You can choose to do it later, but I recommend connecting Jetpack to WordPress as soon as possible to speed up your site creation process. 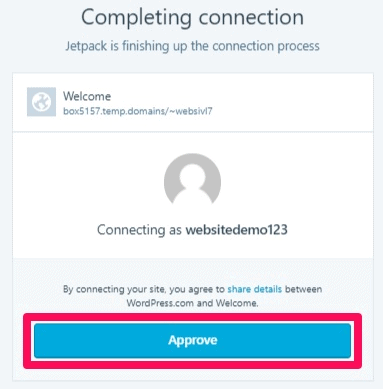 Approve the connection process for your website and Jetpack by clicking the “Approve” button. Then you’re almost ready to launch your site! Add your business information or click “Not now” if you want to add it later. 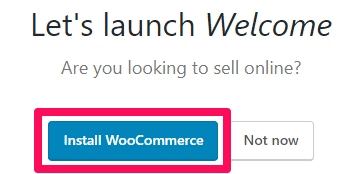 7) Be sure to install WooCommerce if you plan to sell products or services on your website. 8) Now you’re all done and your website will be ready to launch! If you decide you want to customize more options before you launch, this is the time to visit the “Customize your site” area to double check your selections. You can go back to your Bluehost dashboard by clicking “Bluehost” on the left side of the control panel. When you’re happy with your selection and you’re ready to launch your site, hit the “Launch” button! 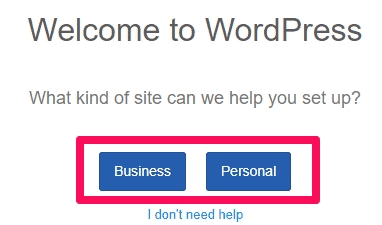 Once you hit this button, your WordPress site will be live. That’s it, your website is up and running now! For more information about changing a theme, adding content to your website, tweaking, editing and adding new posts/pages, go to my homepage and see step 3. In addtion to WordPress, Bluehost also offers “one-click-installation” for Joomla and Drupal. Just click on your preferred website software below the guide will expand (with images). 1) Log into Bluehost (my.bluehost.com) and you’ll be redirected to the Bluehost control panel. From there click on the ‘One-click Install’. 3) Once you have clicked on the ‘Install’ button, you’ll be able to select the domain which you chose earlier. In my case, it’s websitesetup-demo.com. The white box after the forward-slash (‘/’) can be left blank. If you choose to write something – let’s say ‘Joomla’ – your site will be installed to YourNewDomain.com/Joomla. Whereas if you leave it blank, it’ll be installed straight to your root domain – YourNewDomain.com (recommended option). 4) Sometimes the Bluehost/Mojo installation panel might say that “Some files already exist that location“. Don’t worry about it, as it’s just the default index.html page. Just overwrite it by clicking ‘Continue’. 5) Installing Joomla to your domain can take a while (2-10 minutes), so grab yourself a coffee/tea and sit back. Make sure you keep your eyes on the notification bar at the top of your browser. Once the installation has finished, you’ll be able to see the login credentials for your new Joomla website. If you can’t see them for some reason, make sure you check the Notification Center. Congratulations, you’re done! Now you can start editing your Joomla website by logging in with the credentials you just received. If you wish to know more about Joomla, be sure to check my Joomla tutorial here. 1) Logging into Bluehost (my.bluehost.com). You’ll be redirected to the Bluehost control panel. Click on ‘One-click Install‘. 3) Once you have clicked on the ‘Install’ button, you’ll be able to select the domain that you have chosen. In my case, it’s websitesetup-demo.com. The white box after the forward-slash (‘/’) can be left blank. If you choose to write, something – let’s say “Drupal” – your site will be installed to YourNewDomain.com/Drupal. If you leave it blank, it’ll be installed straight to your root domain – YourNewDomain.com (recommended option). 4) Sometimes the Bluehost/Mojo installation panel might say that “Some files already exist that location“. Don’t worry about it, as it’s just the default index.html page. Just overwrite it by clicking Continue. 5) Installing Drupal to your domain can take a while (2-10 minutes), so grab yourself a coffee/tea and sit back. Make sure you keep your eyes on the notification bar at the top of your browser. Once the installation has finished, you’ll be able to see the login credentials for your new Drupal website. If you can’t see them for some reason, make sure you check the Notification Center. And you’re done – congratulations! If you wish to learn how to edit Drupal and add new content, make sure you check my Drupal tutorial here. Once you have a domain name, web hosting and website platform installed, you can go ahead and start reading my in-depth guides for editing your website, adding new content and making it work. If you’re looking to set up your own website quickly and easily, you can have it up and running in a matter of minutes. Start with signing up with Bluehost and following the steps outlined above. Their one-click WordPress installation is as simple as it gets. I tried this and got confused as soon as I tried to install WordPress. Also bluehost charges over $200 initially for set up. It’s not a separate charge for setup. It’s the fee for web hosting, charged upfront. Meaning there won’t be any monthly payments later. Also, you can disable the optional add-ons to keep the cost down, if you only leave Domain Privacy on (which I’d recommend) then the price would go down by half. Our company has an existing web page set-up from WordPress via an IT company. The contracts expired and I need to maintain and edit the web page. What steps do I need to do or download to be able to edit the existing website? Do you have the login info for the admin account? If so you could log in by visiting your domain name with “/wp-admin” typed to the end (for example mywebsite.com/wp-admin), that will take you to the WordPress dashboard where you’ll be able to edit anything you’d like about the site. Can sumup be integrated as a payment gateway on my bluehost hosted site? Also, installing wordpress, is it free? Installing woocommerce for Online store, is it free? Both WordPress and WooCommerce are free to use. I just found your page and I’m loving your info. Thank you! I want to build a new wordpress website for a company that already has a domain name and old joomla site running. How would this work? Would I buy hosting through bluehost and work on the site through wordpress without connecting it to the domain until the end? At what point would I connect the new site to the domain in use? Hi! I just came across this post. You have very helpful information here. I am a bit stuck. 1. Why are they different and how can I remedy this (meaning have the same URL)? 2. Both websites LOOK different because I picked themes on both. I thought if I created on bluehost (since I installed wordpress on there), it would make my wordpress blog look the same as it appears on my bluehost. 3. Do I just work in bluehost now? Do I need my wordpress login since I installed it to my bluehost account? I already have one website through Bluehost, but when I tried to add a second, independent domain the WP wizard says “It looks like there is already a site at ccotechnology.com. Please select a different location.” Any idea how to help? Best bet would be to contact Bluehost’s customer support, they can tell you what the exact problem is. I’m a little confused about launching/using WordPress. I got Bluehost, downloaded WordPress. Should I be able to log into WordPress directly now or does all the editing and updates to my WordPress go through my Bluehost user account? Great site: I’ve just used your instructions to sign up with Blue Host and a create my first website – without your simple guide I would have been stressed. Thanks. More websites to follow. For a total newbie the BH/WP interface is not exactly intuitive, but I’ve been recommended to use a plug-in, Thrive Architect, as a simple drag-and-drop site creator (I also need to transfer across my wife’s commercial site from Squarespace to increase her market share). If you have a plugin in a .zip format, you may install it by uploading it here. Is there a non-zip format way of uploading it? Hi Robert, If I understand it correctly, I will be able to completely form my website using WordPress.org. I’m going to go with BH and already have a domain name. So, by signing up with BH and using WordPress, will I need anything else in order to create my website? Will I have to create the content elsewhere and then put it onto WordPress, or is WordPress the only thing I need? Hi Le, you don’t need to worry about anything else. Once you have hosting from Bluehost and WordPress installed then you’re all set, WordPress has all the tools you need to start building a website. If I buy bluehost plans do I still have to pay for registration of domain name? HI there, and thanks. One question. If I sign up for the 36 month Bluehost (and to secure domain), do I also need to pay WordPress (to be able to use my url without the wordpress add on, and without wordpress ads, and to have my own ads)? Thanks much! No. You don’t have to pay for WordPress. WordPress is free (and will always be free). Hi there, thanks for this info. If I already have a domain with Godaddy, do I have to transfer it to Bluehost? Hello! I have just purchased my domain via bluehost! My question is (apologies if it has already been asked): What happens to my free wordpress blog? ie: blognamehere.wordpress dot com. Is there a way to connect the domain I created through bluehost with my free account, or can I just delete my free blog and just work through bluehost? I’d really love to connect it somehow, but not sure if this is possible? I await your response 🙂 thanks!!! But other than that, you can just delete it as you have a better version of WordPress now that you can work with. Hi Robert, is it usual for the WordPress Install to take so long? I’ve been stuck at the “Nice! Setting up WordPress for you…” loading page for a while now. It should take max ~15 minutes. Sometimes as low as 5 minutes. Let me know how it went. Do you need to have Bluehost if you signed up with WordPress first? I am new at this and am so glad I came across your article! What exactly will Bluehost do? 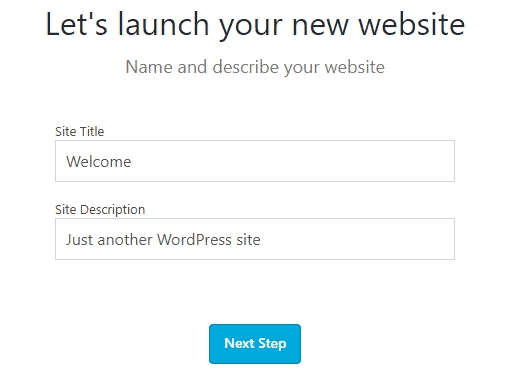 First sign up with Bluehost, then install WordPress (through bluehost). I have been researching your site here and I am so impressed with your level of clarity in helping dummies like me build a WP site and your dedicated service to all of us. I will buy the bluehost through you and follow your lead till my site is done. Thank you!! Do I need to have any kind of WordPress account before I install it with Bluehost? Or is the installation on BH the first place that I let WP know that I exist? You don’t need a WP account beforehand, when you install WordPress through Bluehost an account will be created for you. Can’t we get domain name and host name for free? Thanks for the decent explanation. Can I upgrade my plan before the plan expires? 1) Yes, you can upgrade whenever you want. In fact another staff from the Bluehost cleared all doubts and resolved all the issues. Your recommendations were appear to be very correct. It was also due to my ignorance on knowledge of website creation. Unless and otherwise I code my own website Bluehost staff will need access to the cPanel of my account to provide administrative and support services, without which they will not be able to support customers my like me. Thank you though, with your website guidance I today commenced the creation of my own websites with super confidence. THANK YOU. Keep up the Good and Informative site. Thanks for all the information that you provide. I have two questions about BH. 1. The discounted $2.95/m is for lifetime as long as we use BH or for a limited time then will go up to the normal $5? 2. BH throws in a free domain name. How long can you ‘own’ this domain name, let say, 1 year or 2 years, or for good? Both should be valid for 1 year. If you take hosting for longer period of time, you should be able to get $2.95 for a longer period of time, say 36 months. Price sounds good until you really get into the purchase part. What starts out as $3 something a month ends up being $106 or more when all is said and done. I only want a site for for a couple months and paying by the month you’d think you could pick how long you want it. Nope. Gotta take it for a year. Now it becomes $9 something a month. Please go through the tutorial where I show you how I eliminate all the add-ons so the final price is really low 🙂 Hope this helps. Nice and really useful page. Going trough Bluehost’s packages I found a so called “WordPress hosting” optimized for wordpress. It’s19.99 USD/month. What is the point here? This is for very high traffic websites (100k+ month visits). At first, when you’re just starting out – the basic package would be more than enough. Thank you so much for making me understand that I can also build my website, please I want to know the if I can use the BH basic package for blogging, and if it also safe to allow people post their stories or articles on my blog and Still be the sole owner of it. And is it also possible to switch from BH package to another. 2) You can add users to your blog, but be the owner/moderator. Hi Robert. Please help. I am new to website building and this is my first time to create a website DIY style. I followed your instructions with a twist though. First, I subscribed to GoDaddy for my domain. Then I subscribed to Bluehost for my web hosting. Now I am having a problem understanding if I installed WordPress correctly. When I installed it thru Bluehost cpanel it said wordpress installation is complete, but I think Bluehost is still making me pay or buy themes. I would like to take a package that allows me to first take the free domain and then start creating a blog website with wordpress. Then when my current hosting runs out (in a few weeks) I would like to upload via ftp 2 current websites that I have made with sandvox – possibly switching them to wordpress over time if I like the platform (2 domains and hosting is currently with go daddy). Would this be possible and do I need to transfer the domains to BH. Can I do this through the BH PLUS shared hosting? and what is the difference with the wordpress hosting options on the BH site? You’re correct – Bluehost PLUS should be the correct package for this scenario. The link “Making website with WordPress” seem to be wrong, it goes to Homepage https://websitesetup.org/. Very helpful walk-through. Good job and thanks! Hi there! Thanks for the tutorial.. when I get to the ‘1 click word press install’ step and it asks us to select our domain name that we would like to ‘set up’, there is nothing for me to click in the domain drop down box. Infact, I can’t click it at all. I can only write text after the forward slash / . Any idea? Have you purchased the domain name? You can’t set up a website without a domain name. All you need is internet connectivity and laptop/tablet to install WordPress on Bluehost. Thanks for this tutorial. It is very well explained and straight forward.. If I’m going to need to build multiple websites, ie. a personal website and a business website…would it be wise to use the plus or prime version instead of the basic? Or should I just stick with the basic still? If you’re planning to build multiple websites then indeed the plus hosting package is probably more suitable for you. Hope that helps. Hi, the free domain name that comes with BH – is this free as long as the hosting account is still active or payable at the end of the first year please? Thanks. It should be free as long as you’re paying customer to Bluehost. Following your method precisely through bluehost. I’m getting stuck at the 1 click install for WordPress. It’s trying to make me buy a theme however I’m sure you can get free ones? It won’t let me skip this step through that mojomarket place. I followed all your instructions except choosing my domain name and chose to do it later. Now when I’m trying to install WordPress it is giving me some weird domain name and I can’t choose my own. Any thoughts or suggestions? Thanks for making this so simple! I’m at the point where I can design and I found a free WP theme that I’ve downloaded. How do I get that theme installed to my BH account? You have been a great help for people like me who doesn’t know anything on how to start up my own website for business purpose. I have one question, can my website hosted in multiple countries? When you go with Bluehost (or any other similar hosting provider) – your website will be available worldwide. Hi Robert, I’m about to create my website through websitesetup.org but I don’t see whether Bluehost accepts PayPal? I actually just gave Bluehost a call (amazing customer service) and they deducted the add-ons from my plan. This guide was extremely helpful, but I stopped reading about half way through ( terrible idea). I went crazy with the add-ons , and I regret it. By chance, is there anyway I can downsize my package (only purchase the suggested add-ons)? I have been feeling so overwhelmed figuring everything out on my own! Some guidance is so appreciated! I almost cried when I saw you recommend BlueHost, because that was the site I already chose, and bought 3 domain names for. I read for some hosting companies if you pick their web setup guide/ service you could be stuck with that hosting company forever with your domain name. So if this is true, I was looking for the ability of flexibility if needed, and I was trying to figure out where to go next when I stumbled across this!! THANK YOU! Hi good job. The charges for the site hosting is it paid for annually or can it be paid for monthly, especially for beginners who just want to give it a trial before launching a bigger package. When my partner and I are creating our site, can we sign up as our LLC or do we need to use one of our names for the first and last name sections? We are newbies to this so I am sure that we will be asking many questions. When choosing a domain name how do I pick one that will have the best chance of showing up on the first page of a search engine? Hello Charleen, here’s another websitesetp.org article about domain names to help you choose one. I do have two question, let say I want to build something like the Research gate or Facebook, If I go for Bluehost is that mean I’m losing/sharing my copyright of the idea or any expected profits? Is Bluehost got any access for my visitors database? Hello Jomana, I don’t think bluehost will be able to use your idea as theirs. Yes, they have access to your user’s database, but your data is yours, you can read more about Bluehost’s terms here. Thanks a lot for this wonderful step-step guide, so interesting and helpful. Thanks so much for this useful tutorial, God bless you!!! 1- Social network; where people can chat, share file & as well make call. Hello Emmanuel, here’s my take in response to your question. You can use either the “plus” or “prime” package if you’re planning to build those three websites, because with those packages, you get an unlimited number of parked domains, meaning you can host unlimited websites on your server. As for 1) Social networks are complicated, especially the part where people could connect, communicate and share files, but I believe there are WordPress plugins out there that could help you achieve this. 2) For the football-soccer website, you can do this with the same approach as creating a blog, since you only need to post updates of incoming games and predict the winners. To make it look more than an ordinary blog, you can choose themes to something you think would fit a sports blog. Read more on how to start a blog. 3) For online store websites, you only need the basic WordPress setup, and an e-commerce plugin for WordPress. Thank you for the tutorial. We really appreciate it! This was informative enough to get us started but not overwhelming to where we felt intimidated. Quick question, it appears there is a shift towards https vs http whether you’re taking payments or not. Is this easy to set up and if so do you have a tutorial on that? Setting up a payment system is fairly easy. I haven’t put together a tutorial yet, but will do so soon. If you need more information, get in touch with me. No need to buy a premium theme right away. Explore with free ones first. If you can’t find anything good (which I highly doubt), head over to themeforest.net (there’s plenty of premium WordPress themes). Thank you for the tutorial. I am setting up a website for my photography, with a view to making it an ecommerce site. Is it possible to set the website up using BlueHost and WordPress, and add the ecommerce option at a later date? Does this make the annual cost of the website much more? Many thanks for you help. Honestly, this is the most straight-forward free tutorial online. I went through so many sites and they left me more confused than when I started. You made it very simple. Thank you! Thanks a LOT, Robert! I got my website up and running. It took 20-30 minutes till I started to see my website/domain, but now it’s up. This is really helpful. Can I create a free website on WordPress and then host it with BlueHost, or do I have to get BlueHost service first and then install WordPress before creating my website? First sign up with Bluehost (or any other web hosting that is reliable and offers FREE/ONE-CLICK WordPress install) and THEN install WordPress. No need to go to WordPress.com/WordPress.org. You can start everything from Bluehost :). Great write up and perfect for what I might use. Looking to build a VFW website to get more interests from younger vets. I am volunteering this work to help them out and become a member of course. Thank you so much on this. Booked marked and will read more into it soon. Very great information! Very helpful to me. I was worried about the huge cash I would pay Website designers before I found your article. I will soon start building my blog. Thanks a lot. I signed up with WordPress yesterday before being here at your site. I have a domain name but no host. Really a newbie at this. Should a domain name be copyrighted? It’s a shame that you bought a domain because you can get one free from Bluehost (just use the link at the top of my article). But don’t worry, all you need know is web hosting. Once you have it you can connect your domain with it. And no, in 99,99% of the cases you don’t need a copyright to your domain name. Unfortunately, you’ll need Credit Card or PayPal account. I don’t know any other hosting provider either that doesn’t require CC or PP. Very nice instructions! Like most people here I have my own burning question. When you register a domain, whether free or not, are you then the sole owner of that domain until the end of time, or are you actually renting the domain for a period of time? If you walk away from these particular companies in the future, what control do you have or the your domain? Is there any prof of purchase indicating ownership. Sorry if this sounds a bit fundamental to some, but I’d to clarify what your rights are when registering. You’ll be the sole owner of your domain as long as you pay for it. You can move your domain between different registrars, too (if needed). hello, im currently trying to set up a website but i am abit confused. if i use and pay for bluehost, does that include the wordpress? or do it still need to pay the wordpress fees AND the bluehost fees altogether? Thanks for the really informative tutorial! I already have a domain which is registered through domain.com and when I am installing wordpress I get a message stating, “We noticed the domain you are installing at is not set up yet with your hosting provider. What does this mean and what should be done next? You’ll just need to merge your current domain with Bluehost account. If I select the privacy option am I giving Bluehost the rights to my domain? It certainly seems as though I am with all information being in their name. Before I found websitesetup.org, I was wandering through the setup jungle alone. It took me 2 weeks to sort out my web hosting and domain name! Now I feel able to take the next steps using your guide – you truly understand that there are people who know NOTHING about setting up websites – can’t thank you enough. Great Article! I had a couple of questions for you. I already have my own domain which I purchased from another provider. (1) Do you have to switch the domain over to Bluehost in order to have the web hosting plan from Bluehost? Or can I keep it with the place I originally purchased the domain from? (2) If I went with the plan with the free domain, but wanted to sign up with my current domain. Can you get the free domain at a later time? (3) Finally, if you have two websites and they are both under Bluehost under the unlimited websites plan. 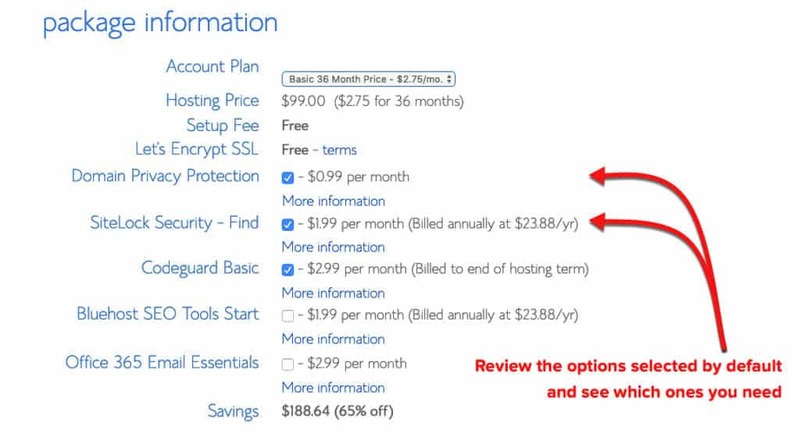 Do you pay double the amount for Bluehost? Or is it the same plan for the unlimited websites? Thank you for your time! I am new to all of this. I have a blogger website that I’m looking to switch over to WordPress.org and it feels overwhelming. #2: From Bluehost you’ll get a free domain. So pick something you might want to use later (in case you already have one). #3: No, you only need to pay one fee (unlimited domains/website), no need to pay double. Hi Robert – may I ask you to expand on this a bit? I purchased a domain name on GoDaddy (boy, I wish I had found your site first! ), and there does not seem to be a way to access WordPress for free. It sounds like I should go to Bluehost and change the domain server as you said. My question – will Bluehost let me choose the domain name I already bought? Thank you so much – this site is fantastic! 1. If you use bluehost for domain and hosting and then wordpress to build your site (basically following your instructions on how to do all this) and decide to let ads go on your website by, for example, “adsense”, or google ads, or whatever; do you get to keep the revenue from this or does Bluehost take some or all of it? And if yes, then how do you prevent that from happening? 2. Also, say you do all this and build your website- now how do you market your business and website and have it show up in google searches, or any internet search engine for that matter? #1. When you sign up with Bluehost or any other web hosting provider, you’ll be the FULL owner of your site. Meaning that no-one can take down your site or add unwanted ads (like Wix or Weebly does). You are feel to add Google Analytics, Banner ads or whatever you fancy. #2. I assume you are referring to SEO, more information on this can be found on backlinko.com – He teaches you how to get more traffic from search engines. Do you recommend a certain package for an online store? when I log-in to my.bluehost.com it ask me to enter password but i do not know what is my password..
Because I didn’t mentioned any password. They usually send you an email where you can set up yourself a password 🙂 If not, just get in touch with their live customer support. Hi! This has been really helpfull because I’m planning to build an online store. However I don’t have any knowledge about how online payments work. Does wordpress have a tutorial or something on how I can add payment options on my website? Thank you! Can you add a paypal plug in to any wordpress theme? I’ve found a theme I want to use but it’s a premium one so I have to pay, but it has woocommerce. If I used it’s basic one (which is free) and added a plug in would that work just as well? Hi Robert, thank you for putting this together. I am confused with the place where I buy my domain name and the hosting site. Why are we not doing everything from one site, as wordpress? Why using bluehost? Thanks for the awesome tutorial and the website! But still I have a bit of confusion, so it’ll be a lot of help if you can clear it out! What I wanted to know is, when we are registering our domain name via Bluehost, are we only getting a valid domain name, email etc (things that are mentioned in their package) by paying $3.49 ? Such that afterwards, when we go on to install the CMS of WordPress in our website, will we need to make further payment to WordPress for that, or is it free ? Can you add a template that you purchase on wordpress at anytime? I have just gone through your blog and I think it is really superb – it is very helpful, simple yet informative. It is easy to follow, even for a 60-yo absolute beginner like me. I have not started building my website – gone through the steps – but when I do, I will not look up any other guide but yours. Thank you very much for this tutorial/guide. Glad you liked it 🙂 If you need any help, feel free to shoot me an email. Is it possible to own two domain names and have them both lead to the same website? I already have a domain with Namecheap.com, but no hosting. Can I transfer my domain to Bluehost.com for hosting and it is difficult to do? Great blog. First time of me reading something like this and feeling hopeful. Can I ask if I choose a domain name through BH, is it possible to change the domain name some time later? Would it cost me something to change it? Thanks!! Hey Robert- what’s the difference between using the free hosting on WordPress and paying for it through a service like BlueHost? Also, what do you think of buying the domain through something like Google Domains at $12/yr to get the free privacy, email and other services Google Domains offers? Free hosting on WordPress will be VERY limited and only giving you a subdomain (yoursite.wordpress.com) – this isn’t very professional, thus I’d suggest you to avoid that. Also, when you want to upgrade from free WordPress to paid WordPress – it’ll become very expensive (around $12/month). So it’s wise to start off with a self-hosted WordPress, with your own domain via Bluehost. As far as I know, BH also throws in a free domain, where you can also add free privacy. Your site and step by step guide is much helpful for a newbie like me…I am stuck at a point deciding to use www. or not in my domain name. Can you please help me pros n cons of using/not using www while installing ? It’s completely up to you. I tend to use without www. (see websitesetup.org). However, I know many webmaster who take www. over non .www. To be honest, there aren’t any cons/pros of using one or another. Your site has been a Godsend! Quick question: I’m getting hung up on the Sitelock Security option while selecting my bluehost package. I know I obsess too much, but is that one really necessary when you’re just starting out? I’ve gotten suckered into different security packages for my pc so I am bit wary about any add-ons. It’s optional. If you’re just starting out, I doubt you’ll need that. But if you site/blog grows bigger, it’s wise to tighten up your security. Hi, I have been trying to set up a blog website through BH but find that because I am a UK resident (I think that is the reason anyway) I need a VAT registration number. It seems silly when I am not intending on selling anything. Is there anyway round this? If I was too early in my business idea to actually implement and put stuff on the internet, is there a way to use wordpress and start designing/building a website without actually reserving/paying for domain and hosting service? This site you have is AWESOME!! I’m wanting to start up a type of social media website with question, answer, topic forums I guess it would be. I’m wondering what add-ons, plug-ins, etc I would have to use to input this style into my website? I am as new and uneducated about this stuff as one can be but I feel I have a pretty good idea and figure wth. Also do you think the pro version 1 or 2 yr plan would be the way to go? In case (with any luck) I have lots of traffic? Any advice would be great. Hi, your tutorial is great! But I have a question regarding installation of WordPress. I’m with Bluehost. The version 4.2.2. is offering “Do it yourself – Install” button and other option “Let us do it for you (Recommended)”. These two options are not connected? ”Do it yourself” option is still free? Thanks you very much for your time to answer! You say on your first page that starting up is “less than a coffee”. But when I get to Bluehost, it seems that I need to buy hosting as well, which adds more to the cost depending on my needs. So there are different “plans” and different “products” available at Bluehost. Do I need both a plan and a product? Also, if I start asking them questions via their live chat option, they’ll soon realize how ignorant I am about the whole process. Are they like car dealers when they find an ignorant customer, with giant gold dollar signs lighting up in their eyeballs? Will they try to sell me lots of crap that I don’t need? Apologies if I sound like a cynical old man who has been screwed too many times by the 21st century service industry, but that’s only because I’m a cynical old man who’s been screwed too many times by the 21st century service industry. Great questions. When I say “less than a coffee” – I’m thinking about the monthly fee of Bluehost hosting which is less than $4. So in general, to set up a website, you’ll need hosting & domain. You can get them both from BH (I don’t think there’s much cheaper options available). Bluehost doesn’t have much upsells, and when you go to their customer chat they don’t usually start “selling”. They try to be helpful and give out some information about their hosting in general. So if you’ve any questions, feel free to get in touch with them. If you run into trouble, get in touch with me. Am I correct in assuming that WordPress is not downloaded to my PC? That being the case the website can be accessed for updates from any PC. You’re right 🙂 You don’t need to download WordPress to your computer. You’ll modify and update WordPress website via your web hosting (Bluehost for example). All you need is computer and internet access. thanks for all the helpful info. I’ve clicked install and now it gives me the option of ‘show advanced options’ not sure what to do here. Which HTML book do you recommend me to learn about HTML? Thank you so much. You have been great help. I have put off building a website for years because I told myself I needed money to pay an expert. But 15 minutes ago, I had an aha! moment. I taught myself to publish my book on createspace and even laid the book out inside myself… and it looks pretty good, with a few sales so far… i think I can teach myself to create a website too. I googled “how to create a website with wordpress” and your website was number 4 on the search results list. And here I am. You make it sound and look very easy. I am getting my website up and running by end of this week. Thank you. Awesome news, Maurice. Let me know how it goes 🙂 If you get stuck, you can always email me. I’ll help you out. Arising from your response to Lisa’s question, I don’t seem to know much about SHARED HOSTING, and sadly, not much information about it is furnished by BlueHost (except perhaps I haven’t searched well enough). Good question. I’ll do a quick recap for both of you. 2) Shared hosting is owned by 10 or so different users, but they all have their own “personal space” which shouldn’t be affecting you. 3) Rule of thumb here: If you’re starting out, you don’t need more than shared hosting. If your site(s), start to generate 100k+ monthly visits, then it’s wise to move on see if there’s anything better out there. The next step is usually VPS or Dedicated hosting which is roughly $50 per month. Personally. I don’t see a point paying that much for a brand new site hosting. I would like to buy the package from bluehost, but unfortunately I don’t have credit card. Is there any other way to make payment? Domain privacy protection means BH does not make information about me, the owner of the website, public? This is for avoiding unsolicited marketing to “help” me get my business going, correct? Or is it something different altogether? Another question, the Backup Pro, is that the only backup solution available? If my site is fairly static and I only want a backup in case I need to recreate it, is there a one-time backup option? Something I could do on my own, update it if major site changes were made? Doesn’t make sense to backup monthly if the site does not change often. 1) You’re right. If you tick the “privacy protection” you’ll reduce the spam/unsolicited marketing that you’ll get to your email. If I am building a business website and taking on-line do I need to purchase the dedicated web hosting option through wordpress? Or, can I start with the cheaper web hosting options and work up to the dedicated hosting later? Great question. If you are just starting out then shared hosting is actually more than you need. If your site grows bigger, let’s day 1 million views / month, then it’s probably wise to move onto dedicated host (which is more expensive, though). Is it possible to change WordPress to Joomla once we have installed it? This is a really good tutorial, I love how you included all the one click installations as toggled content, I wasn’t expecting that at all, nice one! I am currently building a website which may be considered very similar to yours (only I will only be concentrating on WordPress, not the others like Drupal etc). Thanks for this. It’s finding the notification which is tricky – eg on Mojo site – but it was really useful to know that we should expect one for login.